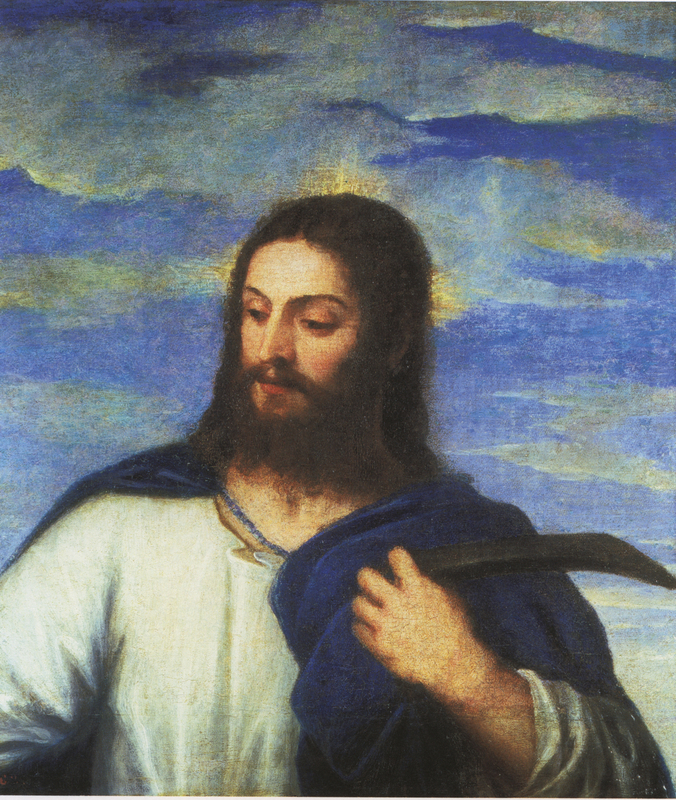 In the remaining fragment of a masterpiece by Titian Christ looks down, presumably at Mary Magdalene, when he appears to her as a gardener.1 Gardeners promote fertility and Christ here holding his hoe, a hand by its blade, is ready to rearrange the earth itself to his liking much as an artist uses his palette knife and paintbrush to shift pigment around the surface of a canvas.2The hoe is thus a hidden substitute for the artist's brush, the hand highlighting its significance. Nor should we forget that Titian had a strong sense of identification with the missing saint as discussed in Titian's Mary Magdalenes. Each of us is made in the image of God though few can see it. That is why artists depict themselves as the Godhead in ways others cannot understand, visible only to those who already know the meaning is there. Yet just as Titian depicted himself as the Son of God in Christ Flagellated (c.1560) and in Tribute Money (1560-8), as I have already shown, so Titian is Christ here too. 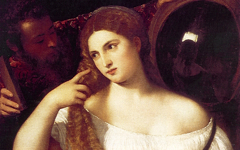 Although the features are more youthful than Titian's in the self-portrait, they are clearly dependent on it in the eyebrows, nose and mouth. There may seem little else in this fragment, but wait... what are those clouds doing above Christ's head? Is that God's face looking down, straight down on top of Christ, its right-hand side and lower features drifting off into abstraction. Only a half-century later Shakespeare would have Hamlet ask: “Do you see yonder cloud that’s almost in the shape of a camel?... Or is it a weasel?... Methinks it is like a whale. "3 Clouds are indeed amorphous and ambiguous but they do have shapes and artists like playwrights can suggest them. A closer look reveals that an eye and eyebrow have been clearly delineated in the clouds above Christ's shoulder on the left (see diagram); the line of a nose and nostril depicts the left-hand side further away, just above the left half of a mouth. The beard on its left side then curves towards the right edge. All else has drifted away or is in the process of doing so. We cannot prove based on the visual evidence alone that this bearded mirage depicts the artist-as-God-the-Father but the circumstantial evidence strongly supports it. In an artist's imagination, as in a mystic's, all divinity is a reflection of one's own self. This may only be a fragment but, like every part of a hologram, it contains the genetic code of the whole. 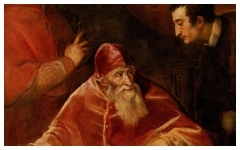 Titian, like other great masters, encourages those seeking a path inwards to continue on their journey because it is only by looking inward that we can find wisdom and truth. And, as the story of art history itself demonstrates, only they who know that God is a reflection of one's own self would ever recognize a great master's inspirational self-references for those on that path. To everyone else the fragment is what it is: a partial scene of the historical Jesus dressed as the gardener, a fine illustration of the Bible perhaps but lacking truth and wisdom. Relax. Look past the superficial forms to see what's really there. 1. Edouard Manet depicted Claude Monet the painter as a gardener in The Monet Family in the Garden for the same reason that Christ as gardener is an artist here. Separately, Titian in his letters often referred to himself as Mary Magdalene, making pleas even for payment in her name. St. Jerome (c.347-420) did too, clearly identifying with the female saint. See Zbynek Smetana, Titian’s Mirror: Self-Portrait and Self-Image in the Late Works, PhD. Diss. (Rutgers University, NJ) 1997, pp. 175-6 and Rona Goffen, Titian’s Women (New Haven: Yale University Press) 1997, pp. 8-11, 178, 185. 2. See also Millet's The Angelus (1857-9) and Other Works. 4. 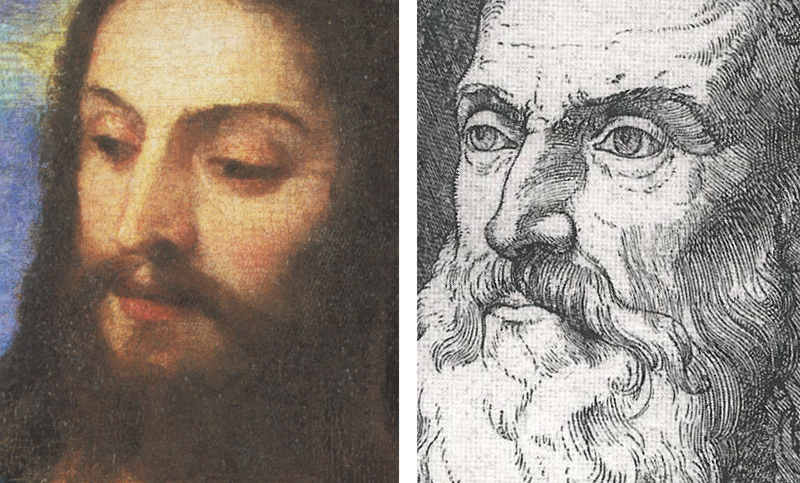 Both men have bi-forked beards as well (not illustrated), Christ's shorter than Titian's. Original Publication Date on EPPH: 23 May 2012. © Simon Abrahams. Articles on this site are the copyright of Simon Abrahams. To use copyrighted material in print or other media for purposes beyond 'fair use', you must obtain permission from the copyright owner. Websites may link to this page without permission (please do) but may not reproduce the material on their own site without crediting Simon Abrahams and EPPH.